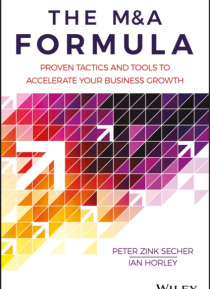 The formula that transforms the probability of success when growing your business with M&A The M&A Formula brings together decades of research and case studies from recognised leaders into a model that anybody can use to grow their business using M&A, no matter large or small. Whether you see it as avoiding the painful failure that currently runs at a Global average of over 50%, or stacking the ca… rds in your favour, business model-driven M&A will definitely help you win by either seizing opportunities from your competition, or failing fast before it really hurts you. M&As fail because the thinking surrounding them fails the rigour of scientific examination; by observing the results of conventional processes and positions, the need for new direction becomes apparent. This book presents a new set of tactics based on data from high-profile M&As, constructing a modern map of practical and business model-driven tactics that succeed in the real world. Case studies of successful deals illustrate on-the-ground implementation of a new M&A model, and tactics formulated by M&A specialists equip you with the wisdom to avoid common pitfalls and costly errors. The M&A sector is continuing to grow, and the trend shows no sign of slowing. Business leaders need a robust, business model-driven M&A strategy for handling these high-stakes transactions, but the usual methods are no longer cutting it. This book provides a new way forward for businesses seeking smart M&A tactics, helping them to: Rethink conventional M&A wisdom in light of recent failures. Adopt new data-backed tactics that help ensure success. Avoid litigation risk and the high cost of failures. Examine practical models and illustrative high-profile case studies. M&A failures have reached global epidemic proportions, with economic impacts to scale. Businesses around the world are in dire need of direction, and as the stakes grow, so do the potential costs of mistakes. The M&A Formula provides sound guidance and a practical new model for successful M&As in the new economy.